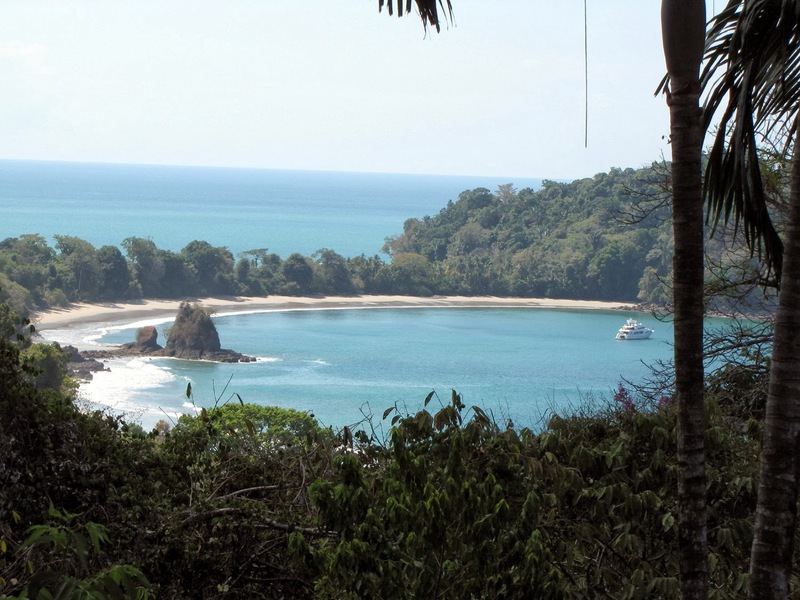 HEAD for a Boeing 727 where it points out towards the Pacific Ocean from Costa Rica's Manuel Antonio National Park, and you'll not have to worry about metal detectors, X-ray machines, pat-downs, baggage searches or any other of the frustrations of big-city aircraft embarkations. Not that they're unusually slack about security over there in Costa Rica. 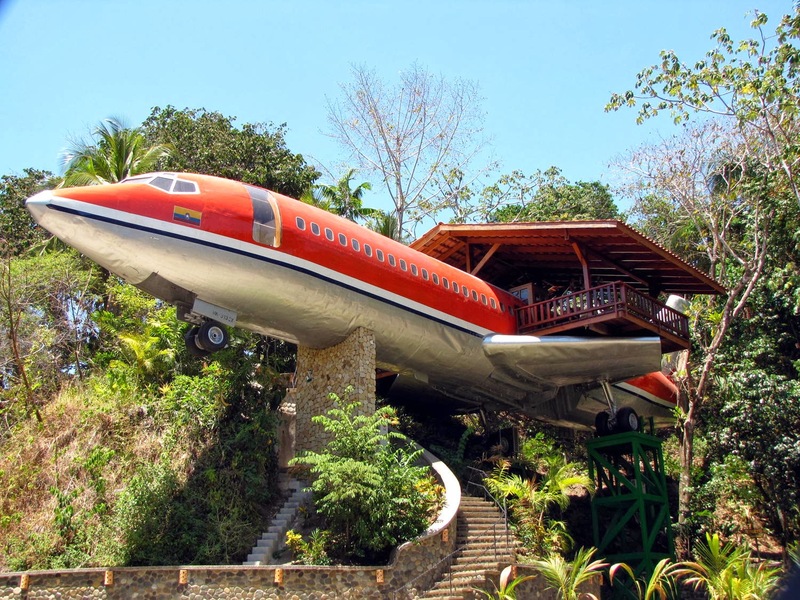 Rather that this 727 isn't going anywhere: it's fuselage sits atop a 16m high concrete tower, its wheels on a couple of sturdy equally-high steel frames, and its nose sticks jauntily out from a rainforest that abounds with everything from monkeys and iguanas to colourful toucans. And the reason you'll go aboard will have nothing to do with flying. It'll be to spend a night or two here atop your concrete tower, indulging in one of the world's most unusual hotel suites – and a view to die for. The so-called 727 Fuselage Home is part of the Hotel Costa Verde that offers a range of accommodation options from traditional hotel rooms to family suites, apartments and studios 300m in from the beaches of Manuel Antonio National Park – one of Costa Rica's most-visited tourist spots. And it certainly gets its fair share of attention. 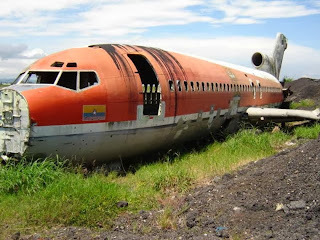 Built in 1965 and operated for many years by South African Airways before being acquired in its latter years by Columbia's Avianca Airlines, the old plane saw sterling service shuttling locals and international globetrotters around Africa and South America before being retired and shunted off to its final resting place on the outskirts of San Jose airport in Costa Rica. There it was slowly stripped, both officially and by vandals and souvenir hunters, until not a window or door remained, all seats, galley equipment, washrooms and the entire internal lining had been removed, and even the flooring torn out. It made for a forlorn sight, until spotted one day by executives of the Hotel Costa Verde passing through San Jose airport, who when told the once-proud old jet was for sale at a give-away price, got immediately excited. So much so that they snapped it up, had the 42m long fuselage and wings cut into sections, and the lot put on five special big-rig trucks for a slow, several days' haul to the Hotel Costa Verde. There everything was put back together again, new windows fitted throughout passenger areas and in the cockpit, and a massive crane brought in to lift it into the jungle behind the main hotel. 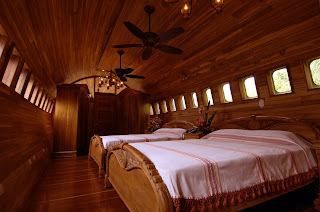 Interior designers and furnishers then spent months turning the 727 into a luxury hotel suite. 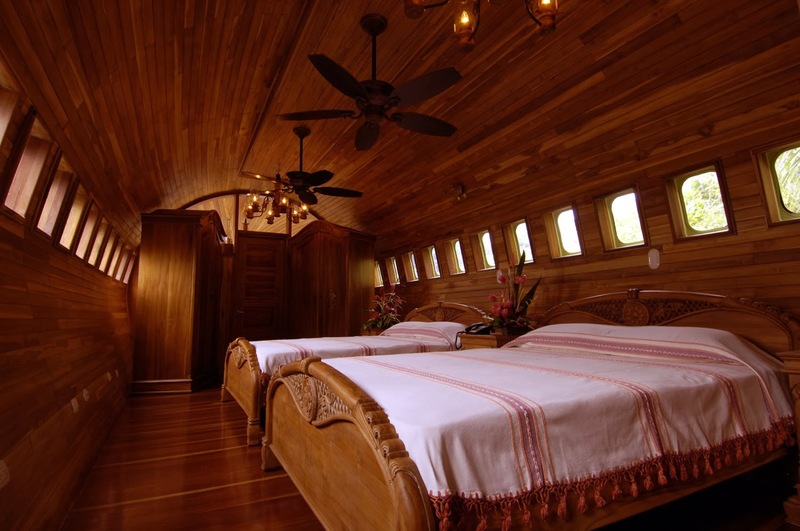 The entire interior was lined with Costa Rican teak panelling, and hand-made furnishings – again teak – bought-in from Indonesia. Two bedrooms were created, the Master with two queen-sized beds and the other with one queen-bed, spacious ensuites installed for both bedrooms, and a kitchenette with adjoining dining area and a TV room popped in. Outside, the fuselage was painted brightly, a winding staircase built to the stub of the port-side wing (its wings had to be clipped because of space constraints,) and on each of the wing-stubs timber ocean-view terraces created, with voluminous shades protecting both from sun and tropical rain. From these terraces guests indulge in million-dollar views of the beach and bay below, the Pacific in the background, the hotel's gardens, and delight in the jungle's inquisitive inhabitants: birds including the huge-billed toucans, monkeys, iguanas, squirrels, sloths, parakeets and woodpeckers. 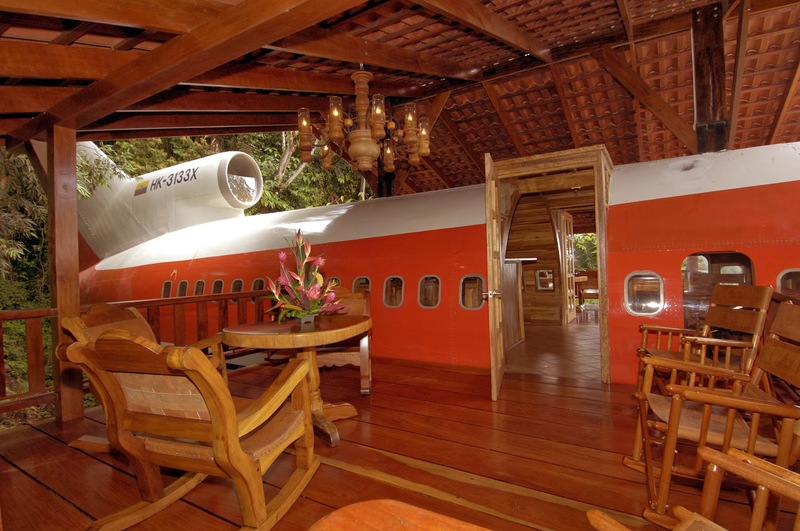 FOOTNOTE: The 727 Fuselage Home story is a happier one than that for Mississippi hair stylist, Joanne Ussery who also bought an obsolete 727 for just US$2000 in 1994, paid US$4000 to move it 100km to her lakeside home-site at Benoit, and US$24,000 to renovate it into her own private home. 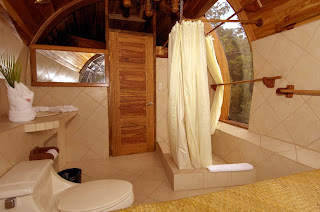 She lived "very, very happily" in it until a few years ago when she decided to move it just 1.5km to another site to go on public display, while she pondered buying a used Boeing 747 for her next "aircraft home." Unhappily the 727 fell of the back of the transporter while it was being moved and was badly damaged; it is still the subject of an insurance investigation. 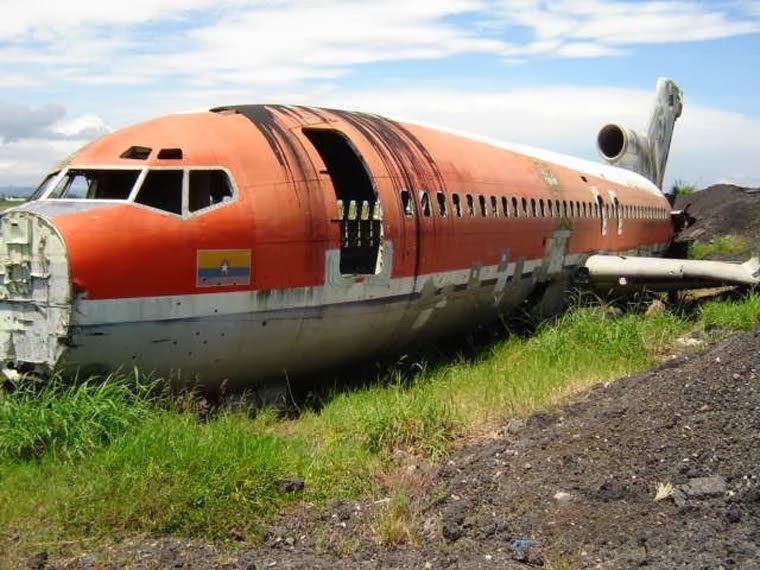 THE Boeing 727 as found abandoned on the side of a Costa Rica airfield. RESTORED and now a luxury hotel apartment. GRAND entrance and wing-top viewing balcony. PALATIAL master bedroom for the most discerning. VIEW over the jungle, lagoon and out to sea. Struth! Plans floated for 50,000 passenger "ship"
Samuel Johnson House: there's a word for it.